I love running. I love snow. That being said, I don’t always love running on the snow. However, conditions today provided the perfect opportunity for one of my favorite snow running practices: “footprint running.” First I’ll explain the exercise, then I’ll touch on the conditions you’ll need to do it in the snow. Footprint running is the term that I use for the practice of running on a soft, compressible surface such as snow, sand, or dusty trail. You can then use the feedback from your footprints to analyze and improve your form. I got the idea from the ChiRunning book’s “Sand Pit” exercise. I look for three elements in my footprints. First, I want to see my feet pointed straight forward and parallel to each other. Next, I want them to look as though I am running down either side of a line on the ground. And, finally, this one is more subtle but perhaps most important: there should be crisp, clean edges at the toe and at the heel. If there are “smudge” or “drag” marks in front of your toes, or deeper crater at your toes, it’s an indication that you are pushing off with your toes or holding tension in your ankles. In order to see your footprints for this exercise, you’ll need to do some doubling-back on your route. Be sure to start at the edge of the path, or somewhere you can distinguish your own marks if other prints are present. Run about 1/4 mile then turn around and examine your tracks as you run next to your prints the opposite direction. You can change your focus and experiment with form changes each lap and then review the results when you turn around. When you use up all the untouched snow available, continue to another part of your route and do more back-and-forths. Just make sure that you turn around to see your tracks each time before they start to melt to much. 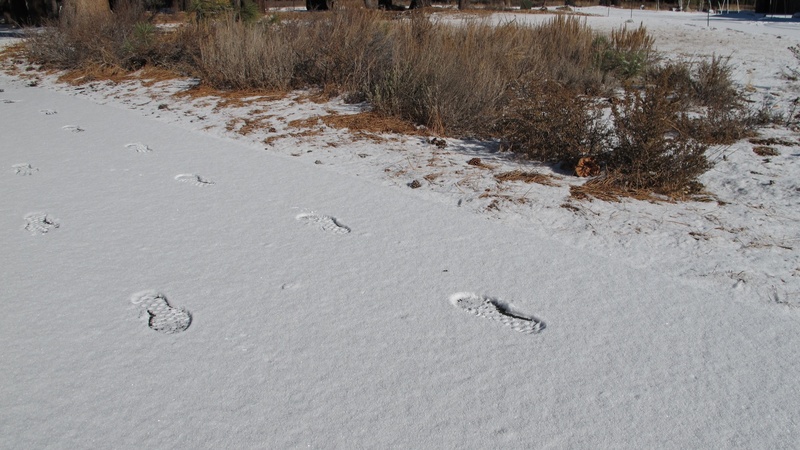 The ideal conditions for snow footprint running occur when 1/2 to 2 inches of new snow has fallen atop a dry (or at least not icy) paved surface. Paved bike paths work well, so long as there is not much competing foot traffic. Roads may work if they have not been plowed and if vehicle traffic is minimal. You should be able to run in your regular running shoes, though you may end up with wet feet. Be aware that it is more difficult to run on slippery surfaces if you are a heel-striker or over-strider. Footprint running is a perfect opportunity, then, to work on your form. You should be able to feel a significant difference in traction between over-striding and a solid mid-foot strike. I am a mom, but not yours! These are my ideas and opinions – use your own judgement. You take full responsibility for yourself when using this information or any information found on this website. Gary’s Crossing – Paved paths and quiet residential roads – Access from the Recreation Center in Truckee or park on the street in the neighborhood. Truckee River Legacy Trail – Paved path – Access the Truckee River Legacy Trail from the new paved trailhead at the end of East River Street in Downtown Truckee. Avoid access via Truckee Regional Park, as the hill from the park down to the river is fairly steep for snow running. Martis Creek Road – Paved road (closed to vehicles in Winter) is subject to plowing, but service is not immediate – Access from Hwy 267 just southeast of the Truckee-Tahoe Airport. Squaw Valley to Tahoe City and Lake Tahoe West Shore bike path – Paved path – Access at Squaw Valley Park or Commons Beach in Tahoe City. The trail is not maintained in the Winter and very icy or otherwise dangerous conditions may exist, especially in the shade. Funny, when I first saw the title of this post I thought you were going to be running barefoot. Glad to see they were actually shoe prints in the snow – you would have certainly gotten frostbite on a morning like this! Maybe the title should have been “shoe prints in the snow”! I did see bunny tracks, too, but opted to keep running rather than pull my camera out again. Thanks for leaving a note, Nighty-night! Thanks so much for your note, Cheryl! I am following you on FB at https://www.facebook.com/MovingInBalance.